A Statutory Authority Under Government of West Bengal, India. Sriniketan-Santiniketan Development Authority (SSDA) has established in 1989 under the rules and regulation of West Bengal Town & Country (Planning & Development) Act, 1979, vide Gazette notification no. 4069 – T&CP/IS-25/87 dated 27th December 1997. Approx 106.281 sq. km. comprising 44 mouzas are under the SSDA jurisdiction (including rural and urban areas). Bolpur Municipality area is also part of this. Out of 44 Mouzas, 40 falls under following Gram Panchayats (Ref. Appendix-1.1), namely – Sian Muluk; Raipur Surpur; Ruppur & Kankalitala. Sriniketan Santiniketan Planning Area (SSPA) has multiple Urban and Rural Local Bodies within it. The Development Authority board consists of 13 members. The SSDA has already started various development work programmes in its planning area. Prantik Township – A Modern Urban Township. With a view to keeping a perfect balance of modern and scientific town planning preserving the cultural and environmental heritage of Santiniketan, this Authority has developed an area over 57 acres at Prantik which is located immediately on the eastern side of Prantik Railway Station. It is about 2 kilometers from Visva Bharati, Santiniketan and 7 kilometers from Bolpur. The Township is equipped with the following utilities and services which are maintained by this Authority since its inauguration in December 1994.
a) Metal Roads, b) Storm Water Drainage, c) Piped Water Supply, d) Electricity, e) Telephone, f) Landscaping. 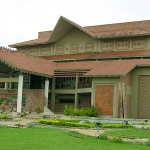 Construction of Rabindra Bhavan Auditorium Complex – First Phase (“Gitanjali”). Main Auditorium with the seating capacity of 750 persons. Seminar Hall with the seating capacity of 200 persons. Meeting Room with seating capacity of 50 persons. Administrative Office with ticket counters. The auditorium is centrally air-conditioned and is equipped with modern Dolby Digital Sound System and with cinema projection facility. Seminar Hall and Meeting Room are also air-conditioned. Development of Solar Village (Urja Gram) at Bondanga. Construction of Low-Cost Houses for homeless persons at Moldanga near Sriniketan. Construction and Development of Roads in Bolpur, Santiniketan, Sriniketan and surrounding urban fringe areas and rural areas. Construction of Rest Shed and arrangement of Intensive Cardiac Care Unit at Sub-Divisional Hospital, Sian, Bolpur.